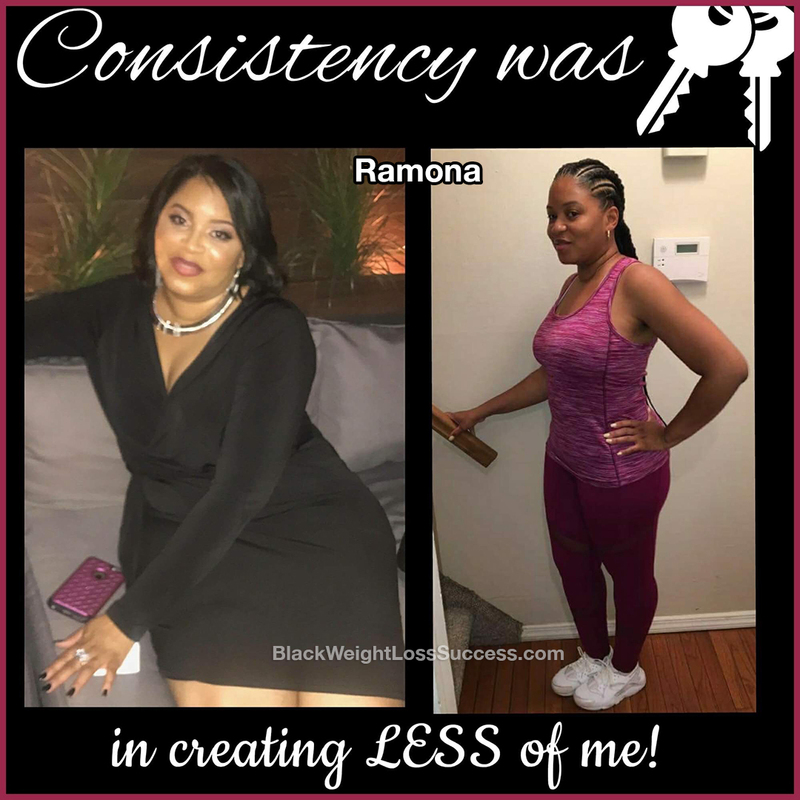 Transformation of the Day: Ramona lost 40 pounds. Photos from a girl’s trip and from her husband’s birthday party served as her wakeup call. She reached out to a trainer for help and changed her eating habits to get results. Over the course of 7 months, she fell in love with working out and her dress size went from a size 18 to a 12. Check out her journey. After seeing myself in pictures from a girl’s trip to Paris in Dec 2016 and pictures from my husband’s 50th birthday celebration in Jan 2017, I got really sad that I let myself get to that size. I cried and had the nerve to binge eat some more. One day, I decided to reach out to a personal trainer I knew who makes home visits. I explained to her that I wanted to get the weight off for good, and that I was serious this time. She agreed to work with me and offered me discount. I started with in-home training sessions twice a week at 6am. After a month of training, I wasn’t losing weight. My trainer said it was because I had not changed the way I was eating. She said that if I did so, the weight would start melting off. So, I did just that. Began meal prepping regularly and following recipes from weight loss groups. I had egg omelets for breakfast, salads for lunch and dinner was usually fish with two veggies. I stopped drinking soda and juice. I completely cut out junk food and I don’t eat after 9pm (because of my work hours and gym schedule). I limit my carb intake, not by really counting carbs, but by only having them once or twice a week. Consistency was definitely key. Before you know it, I lost almost 17 pounds by the time of my next girl’s trip in April 2017 to Jamaica. I was the talk of the trip and that was the extra motivation I needed. Others noticing I was working hard gave me the push I needed. My workout routine is going to the gym 5-6 times a week and doing cardio, HIIT, Spin Class and Zumba. I like to mix it up. I now train with a new trainer 3-4 times a week and take a class here and there. My trainer is the absolute best! He does not let me quit. He will sit in the workout room all night until I complete my reps of every exercise. He pushes me way beyond my limits. We fight and fuss, but without him I would not have gotten this far. Two weeks ago, I competed in my first fitness challenge. Although I came in last place, the goal was to finish. I did and it felt damn good. Trust me, I wanted to quit several times but I had to keep going. When I took days off, I felt different. It was like starting over. Today, I’ve lost 40 pounds in 7 months and I feel great. I love going to the gym and I enjoy trying new healthy options when it comes to food. I get mad when I miss the gym. Now, it’s my #1 priority, it’s my ME time. I don’t have a goal weight but I have a goal size in my head, which was a perfect 10. I stated at a size 18 and today I’m a comfortable size 12. You were gorgeous both in the “before” and “after” pics but the hard work you put in shows!! Congrats and thanks for the inspiration!